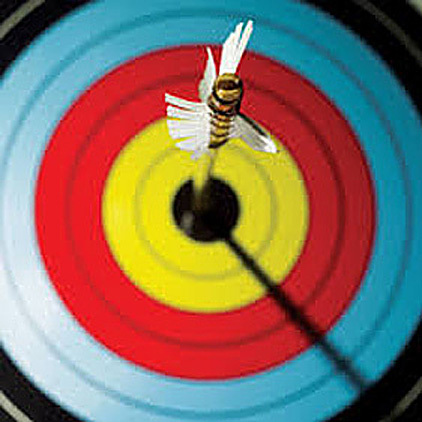 Live ‘on-target’ in 2014 – Beyond Resolutions! If you’d like to target a ‘Bull’s-eye!’ year in 2014, I’ve got some good news for you as you reflect back and look ahead. I’ve just launched a new website www.HitYourBullseye.com and released a new mini-book that can help you. The book is called Beyond Resolutions! How to live ‘on-target’ with confidence, vision and success every day of the year – available in paperback or Kindle on Amazon.com (Click the book cover to go there or click here to see my short YouTube video). My mission with these projects is to help you maximize your God-given potential and impact by harnessing the power of what I call Personal Convergence – that nexus point where multiple parts of your background meet for maximum impact. This paradigm is demonstrated in the lives of standout people throughout history – including David and his famous victory over Goliath, which we briefly study – and helps you see your past, present and future with fresh perspective. The result is true and lasting vision for your life. The website provides a brief introduction and offers a free 5-minute Survey and Assessment that I think you’ll enjoy. I hope you’ll check it out and I look forward to hearing how you make 2014 the best year of your life. Thanks, Robin. Happy New year to you, Gary and the girls.